When we were only operating in San Francisco several years ago in March 2011, we proudly touted that if you rode with Uber, you had an 80% chance of getting picked up within 10 minutes. 94% of rides showed up within 15 minutes. A lot’s changed since 2011. We’re now in 277 cities and 53 countries on 5 continents, with multiple options besides UberBLACK such as uberX and uberTAXI. 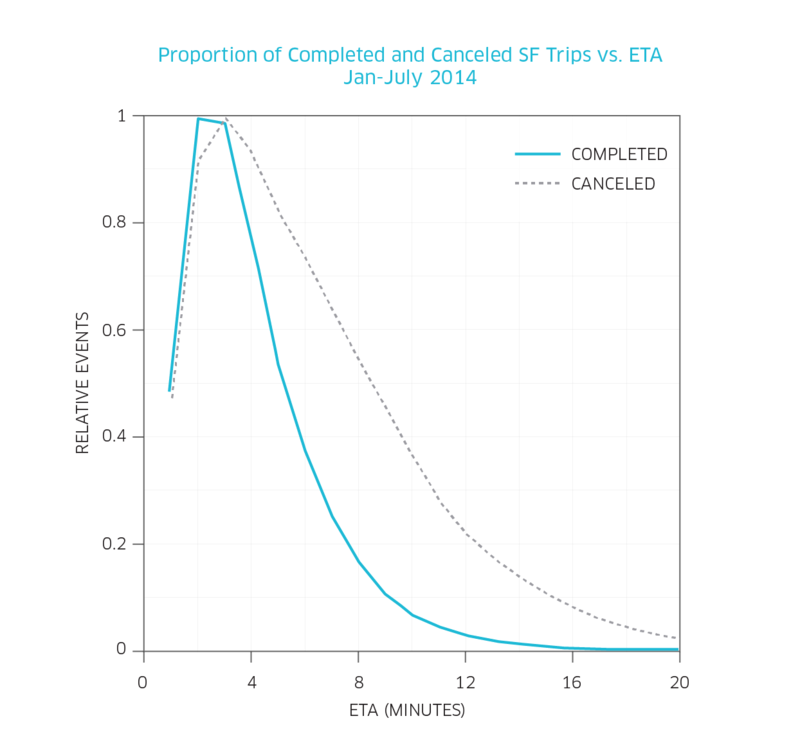 To give you an idea of how much has changed, even just in San Francisco, for 2014 more than 97% of completed trips arrived in under 10 minutes, and more than 99.5% arrived in below 15 minutes. This got the #UberData Team curious: does this increased efficiency lead to increased expectations from riders on our platform? 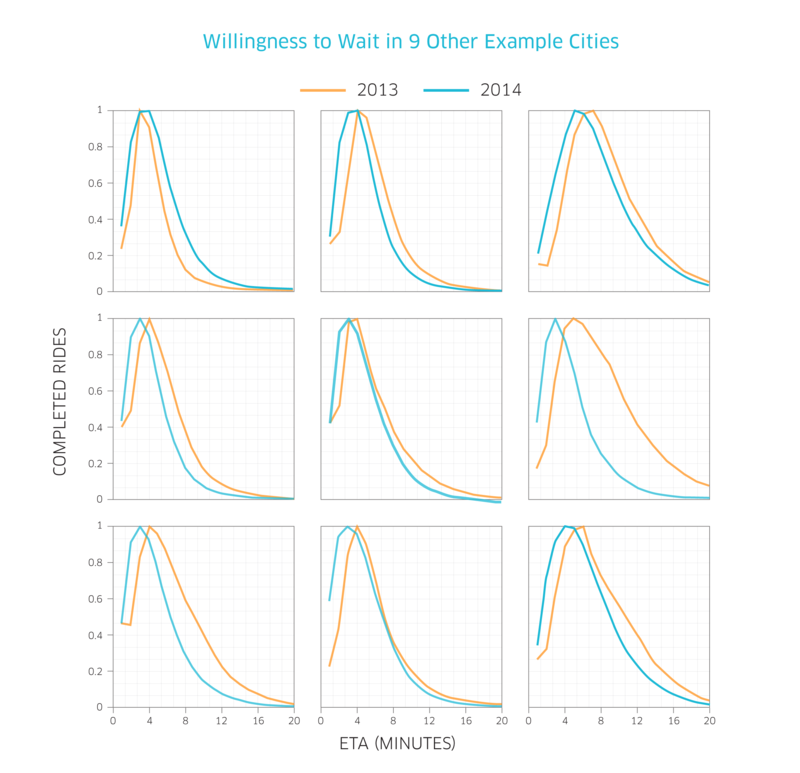 In this post we look at how long people are willing to wait for an Uber, how that patience differs by city, and how it changes over time. You’ll see that once the ETA for the nearest car reaches ~15 minutes, people give up trying to get a ride. Note that, for San Francisco at least, an ETA of >=15 minutes is extremely rare (less than 1% of all instances). But even barring that rarity, when ETAs are that long, people are still incredibly unlikely to complete a trip and are far more likely to cancel the attempt. We can expand this analysis to look at this phenomenon on a city-by-city basis. 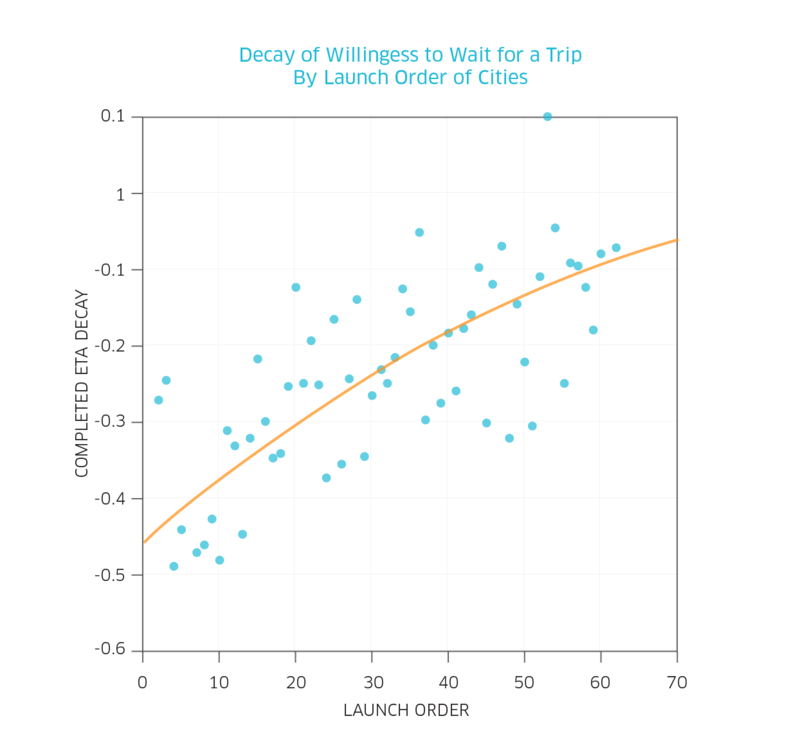 In some cities, if users see the nearest Uber is more than even 2-3 minutes away, they are far less likely to request a car, while in other cities wait times as long as 10 minutes are perfectly acceptable. In some cities if the ETA is too short (1-2 minutes) people are less likely to complete their trip! Check out the shape of that plot above for completed trips. You’ll see that the probability of completing a trip (blue line) peaks at 2 minutes and then very quickly drops off. We can quantify the rate of that drop-off by fitting an exponential decay function (y=aebx) where b is the sharpness of the decay. The more negative is b, the sharper that decay (the less you’re willing to wait for a car). 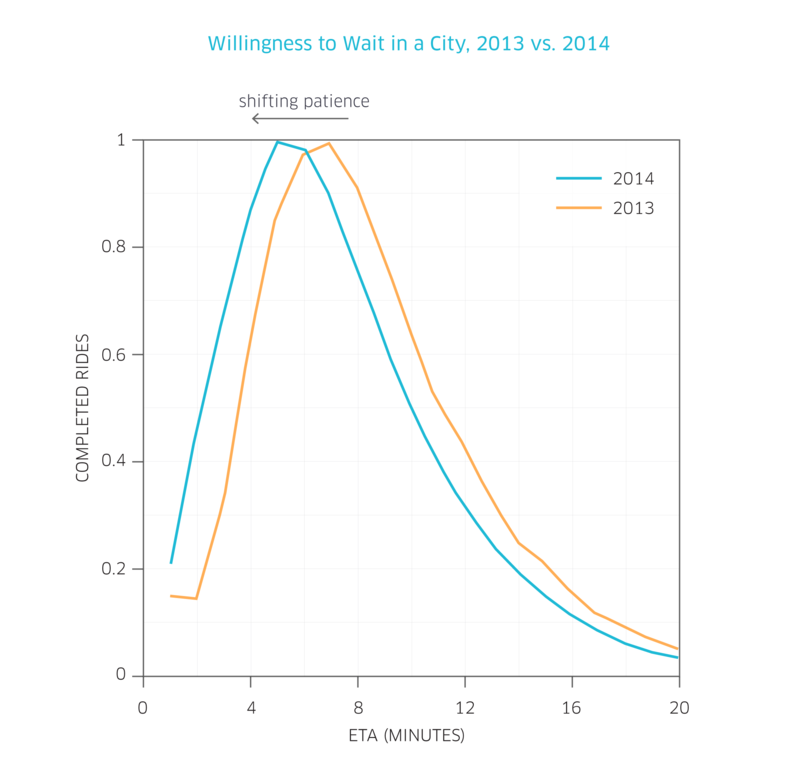 Conclusion: our oldest Uber cities show the sharpest decay in the willingness to wait for a car. Did Uber just happen to launch in the least patient cities first, or do people become acclimated to Uber’s convenience and does that end up shortening how long they’re willing to wait? See how the whole distribution shifts back (moves to the left in the graph) from 2013 to 2014? This suggests that everyone is becoming less willing to wait for a car. But that’s just one city. What do some of our other major markets look like? You can see that from this sub-sampling of cities from all over the world, all but one or two show this backward shifting over time (in ETAs that result in completed trips). The longer Uber has been in a city, the less willing to wait for a car everyone becomes. In all of our cities, the general pattern we see after we enter is falling ETAs due to improvements in our supply (thanks to our partners!) and in the way we optimize our dispatching algorithms (engineering efficiency). Yet with these improvements come increased expectations of lower wait times. The bottom line is that we realize we have to continually raise the bar, to get you home from the bar. We are aware of this challenge, from both a technological as well as people perspective, and are doing what we can to fulfill our mission of bringing reliable rides to all who want them. Thanks for being a part of this movement, and we are excited about the places our platform is going to next.